This article is about the building. For the Bloodmoon faction, see East Empire Company. 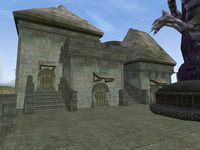 The East Empire Company is an Imperial trading company with offices in Ebonheart and Fort Frostmoth. You cannot join the company in Ebonheart, but you can in Fort Frostmoth. To do so you need to have Bloodmoon installed. The Ebonheart offices and warehouses are located in the eastern section of the city. The only services offered here are some moderate training from J'Zhirr. The warehouses are "guarded" by members of the Fighters Guild, though the guards in the Southern Tower are not nearly as diligent as those in the Northern Tower: they both have their Alarm set to 0, which means that they won't try to stop you from taking anything or even cause you a bounty if you do. At any rate, there is not much of value in either the warehouses or the offices, but look for a copy of A Dance in Fire, Chapter 6, a skill book for Mercantile, on the shelf in Canctunian Ponius' office. This page was last modified on 8 September 2018, at 03:49.